eCite - What Is Engineering Asset Management? What Is Engineering Asset Management? Definitions of asset management tend to be broad in scope, covering a wide variety of areas including general management, operations and production arenas and, financial and human capital aspects. While the broader conceptualisation allows a multifaceted investigation of physical assets, the arenas constitute a multiplicity of spheres of activity. We define engineering asset management in this paper as the total management of physical, as opposed to financial, assets. However, engineering assets have a financial dimension that reflects their economic value and the management of this value is an important part of overall engineering asset management. We also define more specifically what we mean by an "engineering asset" and what the management of such an asset entails. Our approach takes as its starting point the conceptualisation of asset management that posits it as an interdisciplinary field of endeavour and we include notions from commerce and business as well as engineering. The framework is also broad, emphasising the life-cycle of the asset. 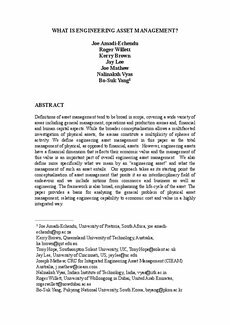 The paper provides a basis for analysing the general problem of physical asset management, relating engineering capability to economic cost and value in a highly integrated way.